Staying with the theme of what’s next for Medicare over the next 50 years let’s talk about Medicare Part A, B and even C.
Medicare Part A covers inpatient hospital services, Part B covers outpatient services and doctor visits, Part C contains Medicare Advantage plans, Part D is prescription drug coverage. I’ve simplified the coverage of each of the parts of Medicare but you get the idea. At this point only Part A and B are guaranteed. The Medicare Advantage Plans and Part D coverage are optional. Medicare Advantage Plans are private plans that offer alternative coverage that resembles commercial insurance and enrollment is growing sharply. The current health law mantra seeks to cut the rate at which the government reimburses insurers to make it closer to what it spends on beneficiaries in traditional Medicare. Nearly a third of beneficiaries are enrolled in Medicare Advantage plans. Many of the plans provide benefits beyond what traditional Medicare covers, such as eyeglasses and dental care, as well as lower out-of-pocket costs. But as federal payment rates decline the plans may become less generous. Another factor to watch is concentration in the Medicare Advantage market with just a handful of insurers now accounting for more than half of the enrollment. The Medicare Advantage Plans are going to be an indicator of the privatization of Medicare which I talked about in a previous blog and the advantage plans may, over time, evolve to a “buy up” option for seniors who want more coverage. 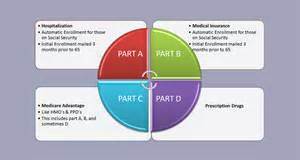 Lines between Part A and Part B get confused at times and patients have a different amount of out-of-pocket exposure between the two. Part A covers services at 100%, Part B has a co-insurance amount but neither has an out-of-pocket cap. So someone utilizing Part B services is on the hook for an unlimited amount of potential out-of-pocket expense. I believe we’ll see deductibles come into existence and out-of-pocket spending caps become reality over time. I believe both will be tied to income. I don’t have a crystal ball and I don’t know what’s in store for Medicare over the next 50 years but I do know it will be different and in 25 years I’ll have a very vested interest in what Medicare covers because at that point I will be a beneficiary!